Creative talent from Scotland’s marketing industry - public and private companies on both client and agency sides – were out in force for the Awards ceremony at The Old Fruitmarket in Glasgow’s Merchant City on 29th May, which was hosted by comedian Fred MacAulay. The Star Awards, sponsored by Tangible Group and now in their fifth year, are aimed at celebrating the most dynamic marketing campaigns in Scotland and this year received a record 191 entries across 27 categories. This unique award was created to mark the 50th Anniversary of the Marketing Society and invited the industry to vote via text and email for the Best Scottish Brand from over the last 50 Years. A panel of judges selected a shortlist of six finalists from the many nominations received which included: Tunnocks, Irn Bru, Johnnie Walker, Baxters and Tennents. The criteria the judges used in their selection included the importance of the brand to the Scottish economy and culture as well as its durability, its relevance today and its demonstration of marketing excellence over the years. The Famous Grouse with Islay whiskies to create a smoky, peaty blend. While Bill Farrar, the sales and marketing director of The Edrington Group, owners of The Famous Grouse, picked up the title of ‘Marketer of the Year’. Other winners on the night included: The Leith Agency, s1, The Edrington Group, Business Stream, ScottishPower, Ignition Marketing, Elmwood, Tayburn/Tenon, Merle Agency, Story UK, VisitScotland, Golley Slater, MediaCom Scotland, Scottish & Newcastle, Denvir and OSL. There are 27 Star Award categories in total. 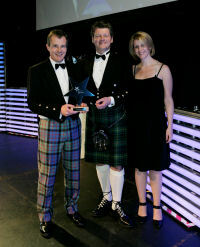 The full list of winners can be found at: www.marketingsocietyscotland.com/stars09.